D. DIVIDE WALL 0.61 M x 71 M.
Two Tanks 0.61 m. X 0.71 m. X 1.60 m. & 1.60 m. X 0.71 m. X 1.37 m. are constructed for one family. For separation into two parts a cross wall 0.71 m. (Width) X 0.61 m. (Depth) X 1.37 m. (Thickness) is suspended for roof. The tanks must be always filled with water and remain coverd. During 24 hours of degestion, Gas is liberated from nighsoil and treated Waste-Water flows out. Anoxobes Decompose Nightsoil, resulting in digested sludge which settles dow. It is manure. It needs more water. It is useful for Rocky, Low-Lying Subsoil water areas. 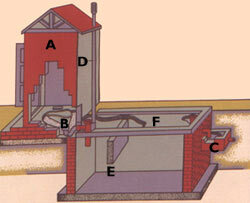 Excess wastewater is sent either to soakpits or to kitchen gandens. It contains nutrients. Insecticides or Pesticides like Phenol or D.D.T. or B.H.C. should not be used for cleaning the Latrine. However, after defaection, it must flushed with atleast 5 Litres of Water (in one second). It may be desludgled of clay, sand & excess sludge (not complete) after about 5 years.